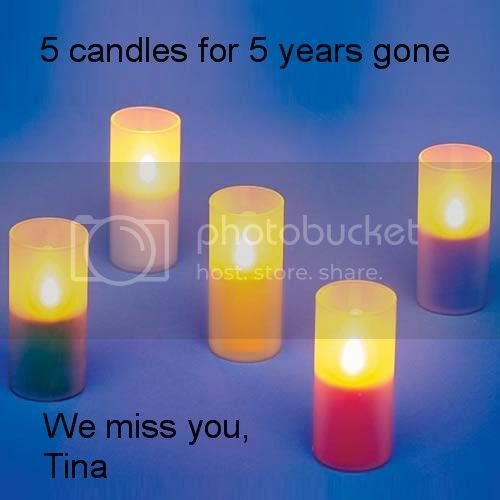 On August 3rd, Tina will be gone 5 years. We will be releasing 5 balloons with her name inside to celebrate her life. I am not there, I do not sleep.I am a thousand winds that blow;I am the diamond glints on the snow.I am the sunlight that ripened grain;I am the gentle autumn’s rain.When you awaken in the morning’s hush,I am the swift uplifting rush,Of quiet birds in circled flight.I am the soft star that shines at night.Do not stand at my grave and cry.I am not there; I did not die. One of my Father's (01/29/30 - 07/13/2010) favorite Irish prayers. I love that Irish prayer. My heart continues to be with you and your family. As always, give that sweet Nicole a hug from me. Last edited by CQ:); 07-28-2011 at 12:04 AM.